Register or log in to your account. Your Sagenda dashboard offers you an overall view of your bookable items, events, existing bookings and account settings. You also get to add new events and new bookable items. Your Sagenda Backend Booking allows you to run searches through your existent client reservations. Status: select the status of the selected service. It can display the availability of your service, the booked items, as well as the bookings that are in progress. Your Sagenda Frontend Booking gives you a preview of how your clients perceive the booking system externally. It also reflects the availability of your service based on your own settings (bookable items and event lists) and on the status of the existent client bookings or bookings in progress. 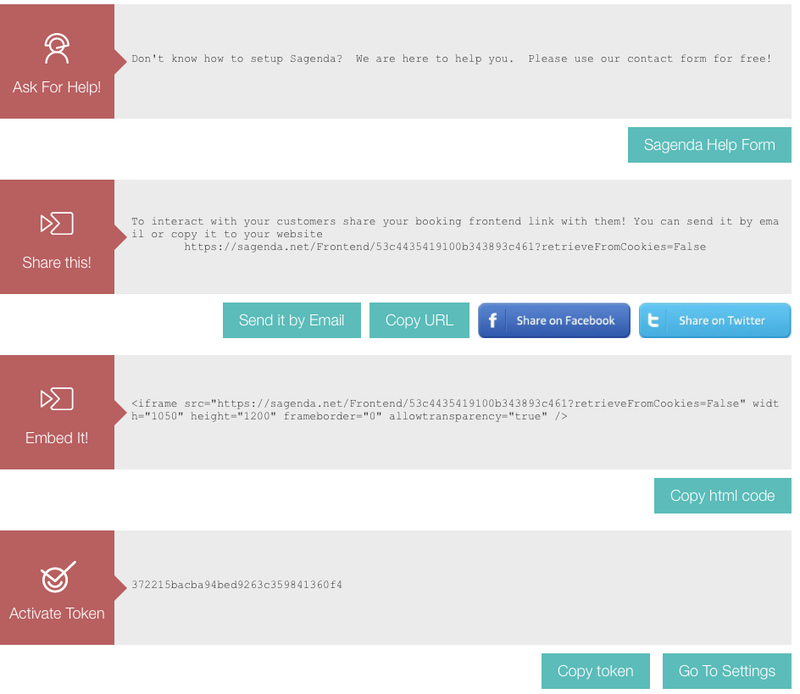 Would you like to have more information on the Sagenda dashboard? Go to our tutorials and learn how to integrate Sagenda to WordPress or HTML.